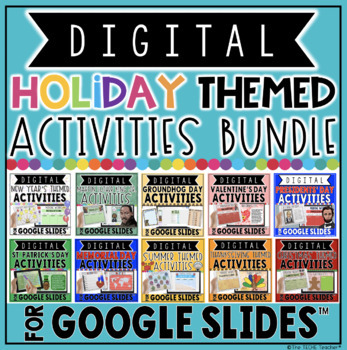 If I end up making more holiday themed activity resources for Google Slides I will be adding them to this bundle. Therefore, this is the lowest price it will ever be! HUGE discount! Some of examples of the activities are: making words, summarizing information, researching fun facts, creative writing, digital designing, watching embedded informational YouTube videos & answering comprehension questions, word searches with important vocabulary, writing poems, highlighting important information, etc..
Each resource comes as a link in a PDF file. First, make sure you are signed into your Google account. Click on the link and you will be prompted to "Make a Copy". Rename the file to whatever you would like. The presentation will be sent directly to your Drive! Disperse to your students via Google Classroom™, Google Drive™ Shared folder, your Learning Platform, etc..